Stefano Rome Tours created this exciting Splendor of Ciociaria day tour into one of Italy’s few remaining undiscovered countrysides that ancient Roman Emperors and early Popes favored as their personal retreat from Rome’s tumultuous life. .You too can leave Rome’s chaotic, crowded tourist attractions behind for a day and venture off into a different world altogether untouched by tourism where time-honored traditions have endured along with the ancient foundations that define the towns. Astonishing legends, remarkably rich history, incredible ancient and medieval architecture and deep rooted traditions accompany the fame of the Casamari Abbey, and the towns of Anagni and Fumone that are situated in the heart of the unspoiled territory of Ciociaria. .You will visit the tranquil medieval Cistercian monastery that was built on top of an ancient Roman city, the town where Roman Emperors spent their summer retreats and Popes were born and lived, and a notoriously haunted castle with shocking secrets. Your personal Stefano Rome Tours English Speaking Driver will pick you up at your hotel at 8 AM in a comfortable deluxe climate controlled vehicle, and bring you back at approximately 5:30 PM. The hilltop Abbey of Casamari lies upon the ruins of the ancient Roman town of Cereatae, dedicated to the pagan goddess Cere. Ceretae was also the birthplace of the Roman consular Caius Marius in 1st century BC, and eventually was renamed Casamari (the House of Marius) in his honor. In 11th century a Benedictine monastic community built the original abbey, but in 1203 it was incorporated into the Cistercian Order and the abbey was reconstructed according to the canons of Gothic-Cisternian architecture that promotes austerity and unpretentiousness. Perhaps because this vow to simplicity and order gives the abbey the breathtaking beauty of its gardens, cloistered courtyard, vaulted ceilings, Gothic arches with delicate columns, stained-glass windows and a spiritually uplifting basilica from which you can sometimes hear the Gregorian chants of the resident monks, especially during mass. There is even a modern museum featuring ancient Roman artifacts discovered in the substructure of the monastery and surrounding fields, and an old world apothecary (pharmacy) brimming with herbs, teas, creams, hand crafted liquors, sweets, and other delightful products crafted locally that make perfect gifts for loved ones at home. At the Abbey of Casamari in the heart of Ciociaria you have the opportunity to experience the peaceful medieval atmosphere of monastic life surrounded by one of Italy’s most beautiful natural environments. Rising to more than 2,500 feet above sea level on an solitary mountain characterized by it’s unique conical shape and crowned with an impenetrable fortress that insulates a medieval hamlet. Fumone’s history is ancient and undocumented, but we know that in 500 BC Tarquinio Superbus, the last king of Rome, retreated here after he was ousted by the Romans and planned his military vengeance against Rome. Fumone’s evocative name, “Big Smoke”, came from the important function it held after the fall of the Roman empire when Fumone became a watchtower due to its geographical advantage, making it possible to keep vigilance against barbarians by alerting towns as far way as Rome of on-coming invasions by means of smoke signals. The phrase the populace lived by was: “Quando Fumone fuma, tutta campagna trema” - “When Fumone smokes, the countryside tremors”. After we walk through Porta Roma, the Roman gate, and enter the medieval hamlet inside the fortress, we will stop at the medieval La Taverna del Barone for an authentic Ciociaria feast fit for kings and queens - so be sure to bring your appetite! There are no menus here, you just sit down, and a full course meal will appear at your table complete with homemade wine, delicious specialties of the day prepared fresh from locally grown products that are in season, desert and coffee. Don’t be surprised if your server will wear the traditional Ciociaria garments along with “cioce”, the ethnic peasant slippers with leather straps that lend their name to the region. After lunch, a stroll through winding cobblestone streets will take you to the famous Castle of Fumone, formally known as the Longhi Castle as per its owners since 1586 when Pope Sixtus V transferred the castle to the Longhi family. In the 12th century the Fumone castle was turned into a prison, and its most famous prisoner was Pope Celestine V, who after renouncing the papal throne in order to return to the simple life of penance, was imprisoned inside a small solitary cell by his successor and nemesis, Pope Boniface VIII, who feared that Celestine may change his mind and resume the Papacy. The elderly pope died a prisoner. This dramatic event made its way into Dante’s “Divine Comedy”. Dante placed Pope Celestine at the entrance of Hell among the religiously uncommitted for having abdicated his papal throne. “Who by his cowardice made the great refusal” (Che fece per viltade il gran rifiuto). On the other hand, Pope Boniface VIII ended up among the simoniacs, those accused of selling ecclesiastical privileges. You will learn more about Pope Boniface VIII and how he met his demise when we visit Anagni. The castle is also rumored to be haunted by a member of the Longhi family who experienced a tragedy inside the castle. You’ll learn more about the legends and secrets of the Fumone Castle on your visit. The castle holds wonderful surprises as well! As you walk through the noble chambers and climb a spiral stairway to the top of the castle you will be greeted by a splendid rooftop terrace garden, and at 800 meters above the sea level you’re getting a bird’s eye panoramic view of Ciociaria’s rustic countryside with green fertile valleys and distant forested hills. Anagni is not just ancient, it’s prehistoric! The earliest occupants settled here more than 700,000 years ago. More recently, during Imperial Rome, Anagni was the summer residence of Rome’s famous and infamous emperors Marcus Aurelius, Septimius Severus, Commodus and Caracalla. 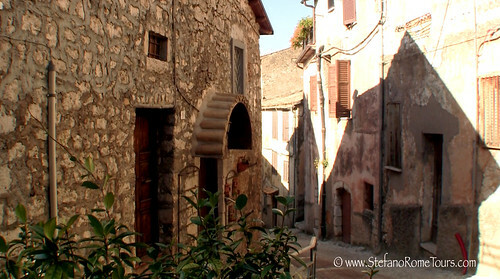 As you admire the breathtaking verdant panorama that surrounds Anagni and breathe in the fresh air, you will agree why during the 10th and 11th centuries popes deemed this region a healthier place to live than Rome. 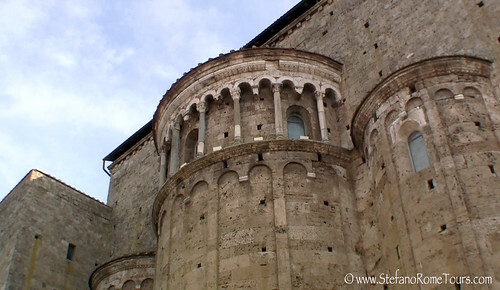 Also known as “The City of Popes”, Anagni produced 4 popes who were all members of the powerful Conti family. Here you will learn about the infamous last of the Anagni popes, Pope Boniface VIII, and why he tragically met his demise at the hands of King Philip of France, the historically dramatic event that marked the end of Anagni’s significance and transferred the Papal seat from Rome to Avignon in France. Aside from its extensive and astonishing history, Anagni is also remarkably charming, inviting you to stroll along its quaint medieval streets lined with artisan workshops, boutiques and galleries. 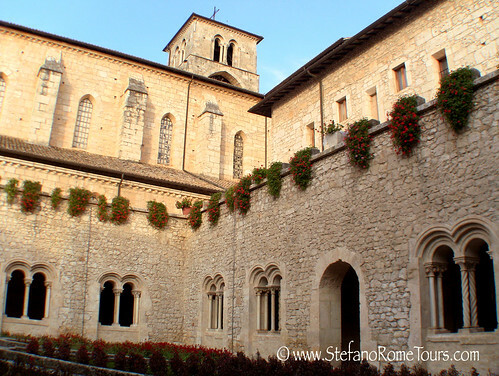 Soon you will reach the architecturally impressive Romanesque cathedral dedicated to Santa Maria. It was constructed in early 11th century over what used to be an early pagan temple that is said to have been converted into a church in mid 5th century AD. What lies beneath the cathedral is a crypt with stunning and vibrant frescoes created by monks that cover the entire walls and ceiling. Inside the crypt are the tombs of St Magno (patron saint of Anagni), and St Secondina of Anagni. Remarkably well preserved, the frescoes inside the crypt is considered one of the best example of Byzantine art in Italy. This crypt is not often open to the public for preservation purposes, but when it is open, it's a lovely surprise! This marks the end of our tour in the countryside region of Ciociaria. From Anangni your will take a relaxing drive back to your hotel in Rome. Thank you for choosing Stefano Rome Tours for your Tours and Shore Excursions in Rome and beyond. I look forward to meeting you soon! * The price of Splendor of Ciociaria tour includes VAT tax, fuel, and applicable toll fees. * The price of Splendor of Ciociaria tour does not include entrance fees into Fumone Castle or other museums or sites, lunch, or gratuities. * There is a nominal entrance fee to visit Fumone Castle, and Museum in Anagni. * This tour to Ciociaria countryside is available only from your Rome accommodation. In Italy only locally Licensed Tour Guides are permitted to guide guests to sightsee away from the vehicle. * Payment will be made in Euro funds at the end of your journey. Pre-payment via PayPal is possible upon request. * High elevation hilltop towns in Ciociaria tend to cooler in temperature than Rome. Please take that into consideration and bring appropriate attire such as extra sweaters or jackets. * When entering churches in Italy, please respect the customs of having your shoulders and knees covered (as many churches may require it).